Marcela presents four sides that are perfect for any holiday menu, and easy enough to make anytime. 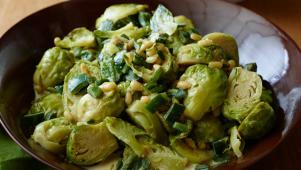 First, brussel sprouts cooked in a sweet and spicy chipotle chile cream. Then potato croquettes filled with cheese and chiles and pan-fried until crispy. 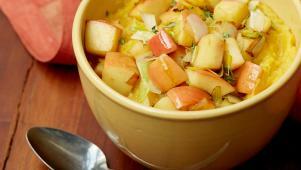 Next she mashes roasted squash and garlic into a sweet puree topped with sautéed apples. 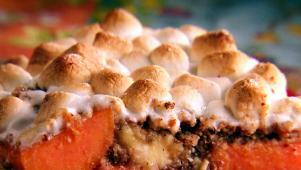 And then bakes yams and apples with marshmallows, finished with a delicious crunchy streusel topping. Served as either dessert or a side, Banana-Yam Casserole is a surefire hit. Can't find achiote? 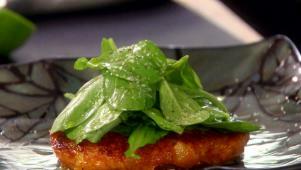 Paprika makes these potato croquettes just as tasty. Roasted acorn squash and garlic with apple and leek: a great anytime side.